Google Earth Outreach team went to the Patagonia's Tools for Grassroots Activists Conference up in Lake Tahoe, California, and the Bioneers Conference in San Rafael, California. At the Patagonia's Tools Conference, all types of activists came together -- individuals such as Tim DeChristopher, who stood up against America's dependency on oil and non-renewable energy by disrupting a BLM oil and gas auction, to organizations like Surfrider and Trout Unlimited. Inspired by speakers such as Brian O'Donnell from the National Conservation System Foundation and Owen Bailey of the Sierra Club, these groups learned about campaign strategy, fundraising techniques, and internet tools for getting their message out. Patagonia founder and lifelong environmental activist and inventor Yvon Chouinard and Oberlin University's Distinguished Professor of Environmental Studies, David Orr, were the special guests who wowed the audience with inspiring stories of grassroots environmental activism. The Bioneers Conference welcomed, as a plenary speaker, one of our close partners, Chief Almir of the Amazon Surui Tribe. We visited the Surui in the Amazon last year to train them, and several other indigenous tribes, on using Google tools like Picasa and Blogger to share their culture and their way of living in the rainforest with the rest of the world. They were also using Google Earth to show where illegal logging is taking place. Chief Almir was in the Bay Area with his non-profit partner, Amazon Conservation Team, to celebrate the opening of Denise Zmekhol's film, Trading Bows & Arrows for Laptops, at the Mill Valley Film Festival. At Bioneers, the Google Earth Outreach team also taught two Google Earth and Maps workshops, including one focusing on indigenous mapping. 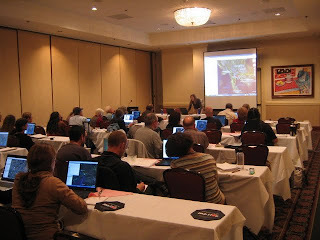 Non-profit organizations who didn't attend one of these events can view complete tutorials online at http://earth.google.com/outreach. We had a great time working hands-on with non-profits at both these conferences, and are looking forward to next year! Last week, the Google Earth Outreach team went to the Patagonia's Tools for Grassroots Activists Conference up in Lake Tahoe, California, and the Bioneers Conference in San Rafael, California.